Transient killer whales are gallivanting around Puget Sound like they own the place — and maybe they do. For decades, transients were not well known to most observers in the Salish Sea. But now these marine-mammal-eating orcas are even more common than our familiar Southern Residents, the J, K and L pods. In fact, transients are becoming so prevalent that it is hard to keep track of them all. Some observers say up to 10 different groups of transients could be swimming around somewhere in Puget Sound at any given time. “This is nuts!” exclaimed Susan Berta of Orca Network, a nonprofit organization that keeps track of whale sightings. “This is more than we have ever seen! This video by Alisa Lemire Brooks shows a group of transients taking a California sea lion at Richmond Beach in Shoreline, King County, on Monday. Much of the close-up action begins at 6:30. If you’ve followed the news of the J, K and L pods and you think you know something about killer whales, you may need to refine your thinking when talking about transients. In fact, some researchers contend that the physical, behavioral and genetic differences between transients and residents are so great that the two kinds of orcas should be considered separate species. 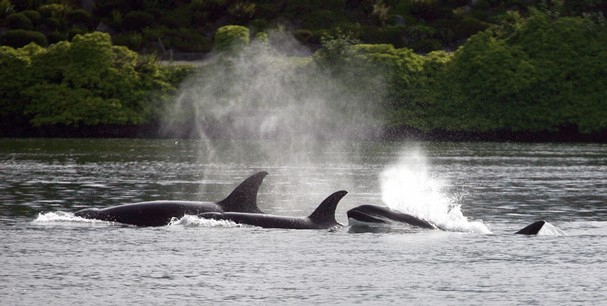 A group of eight transient killer whales pass by Bremerton’s Lions Park Thursday afternoon. Kitsap Sun photo by Larry Steagall. I was at my desk Thursday afternoon, tracking down some information for a story, when a call came into the newsroom: Killer whales were passing under Bremerton’s Manette Bridge. Oh sure, I thought, I’ve heard this type of call before. Although I never fail to check out orca reports, such calls usually lead to what I call a “wild whale chase” with no whales being found. It usually turns out that someone has seen a sea lion resting on the surface with a big flipper sticking up in the air. A moment later, I got a call at my desk. It was Howard Garrett of Orca Network, who had heard about eight transient killer whales on their way toward Dyes Inlet. He mentioned that marine mammal biologist Brad Hanson was following them in a boat. My heart skipped a beat, and the rest of my day involved talking about whales, watching whales and writing about whales along with the people watching them. Please check out my story on the Kitsap Sun’s website. In a new development, resident killer whales have been seen toying with harbor porpoises, according to a story by reporter Larry Pynn, who writes about the phenomenon earlier this month in the Vancouver Sun. We normally think of predator-prey relationships as being highly efficient systems with little waste. But Puget Sound researchers are finding that some transient killer whales seem to be killing sea lions for no apparent reason. I’ve always thought that predators kill and eat what they need for survival, thus holding in check the prey population. Predators would never kill more than they need, I assumed, because they would risk eventually wiping out their food source. Well, it’s time to rethink how some predators think. Joe Gaydos of the SeaDoc Society tells me that transient killer whales, which eat marine mammals, have apparently killed three Steller sea lions and one California sea lion within a month’s time in Puget Sound and the San Juan Islands. Examinations of the animals show that they died from blunt trauma, including broken chest bones and abdominal cavities filled with blood. No gunshot wounds or other complicating factors were seen. Joe told me that boat strikes can cause similar injuries, but it seems unlikely that this many boat injuries could occur in the same precise way with no other injuries being observed. Instead, it appears likely that transient orcas killed them without even taking a bite. “Cold-blooded killers,” I suggested. I should have asked him about a recent incident in which a group of transients attacked a much-loved gray whale near Whidbey Island before letting it go.